The article provides a brief of technological schemes for compaction of metal materials. The prospects and economic efficiency of non-compact charge by combining of processes of electric heating and negligible pressing force without use of powerful and expensive press equipment are shown. The scheme of pilot installation is resulted and functional technological scheme of pressing of metal materials is described and also the basic technological parameters of process are given. A resources-saving method of iron and steel making providing direct alloying of Fe-C alloys with metallic elements from oxides has been created. Use of metal oxides lowers the prime cost of finished products, since the total cost of metal oxides and reducer is always lower than the cost of the equivalent amount of metal in ferroalloys. Key words: vanadium irons, wear resistance, direct alloying, carbon oxide inclusions, ferritepearlite matrix. Factors influencing the solubility of solid metals in aluminum melt using the pour method of alloying are discussed. Consideration of the factors influencing the solubility of alloying elements in aluminum melt, and their skillful use in the alloying tablet production technology and aluminum metallurgy allow effectively using the advanced method of the pour method of alloying in metal-making technologies. Key words: ceramics of metals, alloys, flux, water glass, pressings, density, solubility. Received from concentrate of the Algaminsky deposit alloy contains, %: 27…35 Si; 28…45 Zr; 0,3…0,5 W; 3…6 Al; 2…5 Mg; 0,1 Ca; Fe – the rest. The fusion temperature of alloy makes 1160°C, relative density – 4,88…5,5 g/sm3, it is well ground. Alloy is recommended for use in alloys on basis of Fe, Mg, Ti, Al, Cu, Mo, Zn. Its application for manufacture of solders on the basis of Sn, Pb and Ag, and also for manufacture powder welding-filler wire and powders for dusting is possible. Key words: zirconium concentrates, zirconium us alloy, electroslag melting. 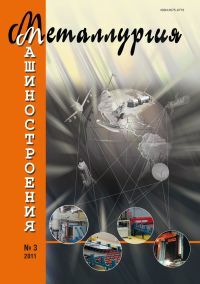 Results of investigations into the effect of melttreatment with hydrogen-containing substances and conditions of casting crystallization on the temperature coefficient of linear expansion (TCLE) of aluminum are given. Effect of subsequent heat treatment on the TCLE has also been studied. It was found that by selecting an optimal regime of melt treatment and crystallization the TCLE of aluminum at low test temperatures can be lowered. Additional lowering of the TCLE is observed after ageing. Key words: temperature coefficient of linear expansion, heat treatment, melt, hydrogen-containing substance, dolomite. The authors have developed new and improved well-known thermographic technologies for express-analysis of cast iron composition and structure.As a result of completed investigations a complex of thermal methods and equipment for express control of the cast iron chemical composition and graphite form has been developed. The complex includes thermogaphic, thermoelectric and thermodynamic sets. The sets provide the proximate analysis of C, Si, Mn weight content and carbon equivalent calculation and the determination of the graphite form. Key words: rapid analysis, thermoelectric converters, graphite shape, carbon equivalent. Martyushev N.V. Improvement of Properties of Lead-Containing Bronzes by Their Alloying and Microalloying The given review contains data on influence of alloying and microalloying elements on structure and properties of bronze with lead. In the review results of researches of domestic scientists about influence of additives of ultradisperse powders on properties of bronze founding are resulted, the problems arising at such alloying and ways of their decision are considered. Optimum structures of microalloying additives for various copper alloys are resulted. Key words: bronze, microalloying, alloying, liquation, ultradisperse powders. Creation of technologies using technological means of impact for controlling the solidification of castings and ensuring their production free of shrinkage defects – is one of the directions in resources saving. Using the developed methods, a design analysis of effectiveness of technological means of impact on the solidification of heat-resistant alloy ingots in ingot molds is presented. Key words: cAD of casting processes, technological means of impact, ingot mold, heat-resistant alloys. Experimental studies and the dependence of hardness and internal stresses in the layers nitrotsementovannyh directional metal die steels. The dependence of the magnitude of residual stresses on the depth of carbonitriding clad steel, which allows the development of techniques for improving reliability of stamps. Keywords: intrrnal stresses, carbonitriding, surfacing, die steels. Stulov V.V. On the Heat Exchange during Cooling of Metallurgical Machines Cooling of a machine’s crystallizer using a heat pipe consisting of a ribbed pipes section with a collector, heated by a tube electric heater was simulated. The novelty of the results is confirmed by patents for inventions. Key words: steam explosion, crystallizer, heat pipe, tube electric heater.